During IPL season everyone becomes an expert in cricket. People who do not know ABCs about cricket will start discussing about strokes, styles, strategies. During that period, Twitter will be a mayhem. During ELECTION season in India, everyone becomes a politician. Every Facebook user will start talking about political parties, reforms that Political parties are supposed to do. Some great friends have become great enemies during election season. Now football, everyone becomes a pro footballer and talk as if they played Dikilona with Pele (thanks to google. wiki, twitter, media). People who do not know anything about football have now become experts. I was an avid football fan and I remember every single match of the 1990, 1994, 1998 and 2002 world cups. After that, I lost touch with football. I have always been a Brazil fan. Dunga, Romario, Ronaldo and Ronaldinho are some guys who I have admired during each world cup. But in the last one decade, I do not know what is going on in the football world. I don't even know who plays for what team. The next one month, Social media will be buzzing with Football news. Footballers will trend in Twitter and Indian fans will get more involved in football than the players on field. It would annoy some real football lovers; but still you got to bear with the empty vessels. Let them make some noise too. That noise will become mute once the world cup is over. As a Brazil fan, I tried to watch last night's opening match between Brazil and Croatia. I know only Neymar and Oscar. So before watching the match, I spent some time on Wikipedia and tried to understand about each player. After going through their profiles, I have a feeling that Brazil may not be the best team in this year's world cup. This was evident from last night's match against Crotia. Brazil was not the best team yesterday. They scored all 4 goals (including the self goal). 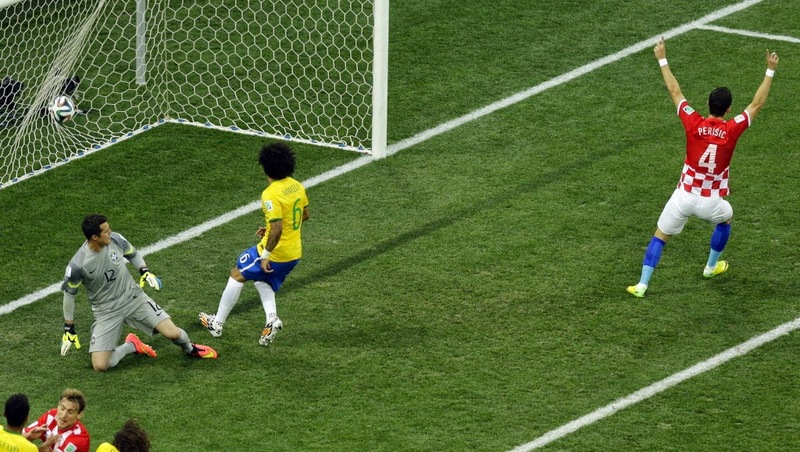 The Brazilians did not play Samba style of football. Their defence looked weak. But still they managed to sneak in 3 goals in the Croatian net. Brazilians even played rough football. Neymar received a yellow card and he continued to play rough game. Seeing his play, Scholari replaced him with a substitute in the dying minutes of the game. What I hated most was the Sony Pix coverage of the match. It was pure torture. When Gaurav walked in, I had a feeling that it would be like the IPL talkshow and he proved me right. The best thing about the show was the commercials that came in between (This was told by my friend Vidhyashankar). Brazilian footballers should get a hair cut; especially those who have Mallinga's hairstyle. They tried to score three own goals.Mallinga's bowling action and their leg action were similar. Brazil adopted the Selfie movement. They started the tournament with a selfie. Dhoni should walk in at least during the dying moments of the match if Brazil is trailing by a goal. Our Captain Cool can make things possible with his helecopter shot. The Japanese referee was surrounded by the Croatian players and would have felt like "Mummy paavam. No bad words.. No No No.. Daddy also paavum" when he gave the spot kick to Neymar. I still would back Brazil just because they wear the yellow jersey. I am a CSK fan. Chennai Super Kingsukku whistle Podu. Very true. About the wiki experts :) Though I dont watch, I remember in college campus a few of my batchmates (Sivaraj and a few others) used to watch EPL matches on TV. Mostly football players were from Nagercoil/tirunelveli. The entire hostel gang would fight with them to change the channel. Now that FB updates and office discussions on Football and F1 are a requirement, most of them have switched over to these games. I can see guys who then fought for changing the channel, now updating on FB as if Man U was part of their blood when they were born. How peers and social networking changes us :) If there is no FB half of these guys will be asleep at night over the next month.